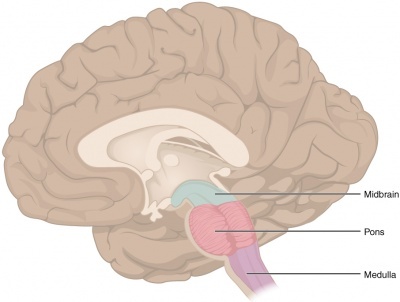 The Pons is situated in the brainstem. 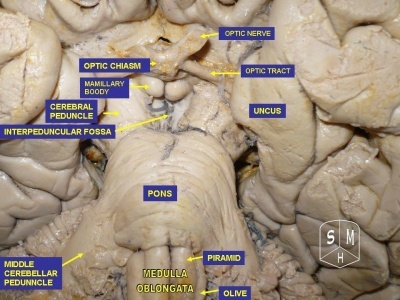 It lies above the medulla, below the midbrain and anterior to the cerebellum. Central pontine myelinolysis is a concentrated, frequently symmetric, noninflammatory demyelination within the pons. The area involved is usually confined to the basis pontis but occasionally involves the tegmentum too. It is one of the demyelinating conditions and was first described by Adams et al in 1959. In at least 10% of patients with central pontine myelinolysis, demyelination also occurs in extrapontine regions, including the mid brain, thalamus, basal nuclei and cerebellum. The exact mechanism that strips the myelin sheath is unknown. Central pontine myelinolysis occurs most often as a complication of treatment of patients with profound, life-threatenin-g hyponatremia (low sodium) and is a consequence of a rapid rise in serum tonicity following treatment in individuals with chronic, severe hyponatraemia who have made intracellular adaptations to the prevailing hypotonicity. In some cases, demyelination occurs outside the pons too; cases which include extrapontine demyelination are labelled "osmotic demyelination syndrome", "extra pontine myelinosis" or "osmotic myelinosis". Microscopically the lesion shows degeneration and loss of oligodendrocytes with preservation of axons unless the lesion is very advanced. The classic clinical presentation of central pontine myelinolysis is progressive spastic quadriparesis with pseudobulbar palsy. 1st phase = acute encephalopathy, caused by the electrolyte abnormalities. Conditions predisposing patients to central pontine myelinolysis include alcoholism, liver disease, malnutrition and hyponatraemia (an electrolyte disturbance in which the sodium ion concentration in the plasma is lower than normal). CPM may occur following liver transplantation surgery. Burn patients may develop CPM and it can also occur with Wilson disease and neoplasia. MRI is the most useful imaging technique in these cases. T2-weighted MRI images demonstrate hyperintense or bright areas where demyelination has occurred and has been caused by relatively increased water content in those regions. Patients who survive central pontine myelinolysis likely require extensive and prolonged neurorehabilitation. Incorporate occupational, physical, speech, and language therapists early in the care of such patients. Swallowing studies are necessary to evaluate for dysphagia and determine the risk for aspiration pneumonia. Graff-Radford et al examined the clinical records of patients diagnosed as having CPM identified by a search of Mayo Clinic medical records from January 1, 1999, to December 31, 2010. Diagnosis was made by clinical and radiologic features. Their objective was to characterize clinical and radiologic features of patients with central pontine myelinolysis (CPM) and identify variables that predict outcome. They concluded: "Clinical outcome in patients with CPM is not predicted by the volume of radiologic T2 signal abnormality on MRI or the severity of hyponatremia. Serial brain imaging is of value because a substantial proportion of patients have normal findings on initial MRI". ↑ DeWitt LD, Buonanno FS, Kistler JP, et al. Central pontine myelinolysis: demonstration by nuclear magnetic resonance. Neurology. May 1984;34(5):570-6. [Medline].